Hi Brendan, I'm just waiting for my new Power Harmonicas and have a look at your entertainer viedeo. Really well done. Maybe it's not your personal taste, but if you would do something like this for other genres (american folk, jazz ... etc), it would show the possibilities of your tunings and harmonicas to many other players. The Entertainer also contains the sheet music in PDF format. What combination of software and plugins did you use to create these sheet music? With these tips it is also easier to implement existing sheet music into your custom tunings to support distribution. The basic file I found on thesession.org, and then I added the tabs myself. Really easy once you have a program, I think. There are many different softwares for translating this to images or PDFs, some of which are found online. You could try to enter it at http://www.mandolintab.net/abcconverter.php , though the results look more professional if you download a program to your computer and do it locally. I have some nice PDFs, but I'm not sure how to upload them in a convenient way for you to see. ... I have some nice PDFs, but I'm not sure how to upload them in a convenient way for you to see. 2. Link the code here. If you want to create a PDF out of any file (like MSword.doc etc.) you can use "FreePDF". (It is share ware.) Install "FreePDF" as a printer driver.Then you can use the function "print" upon the document you want to convert into PDF. Instead of printing a hard copy, you can save the document on your hard disc as a PDF as well. I hope it can be a help to anyone. Mix O'Lydian - is this an Irish scale? I think harple might be inquiring about the notation software rather than the pdf conversion per se? Assuming so, here is the process I used. Since I don't read music, I wanted to input the score by simply playing - rather than laboriously dropping in notes one by one with a mouse, as I've had to do for all my previous instructional books. I looked into various ways to do that. Initially I hoped pitch-to-MIDI conversion software from an audio recording would work, but the current technology is simply not foolproof. Whatever software I tried, I found the files required huge amounts of clean-up afterwards, which was very time consuming and frankly rather beyond my musical notation skills. In the end I opted for using the DM48 MIDI harmonica to record The Entertainer into a DAW (Reason is what I used). This is NOT as simple as I hoped/imagined it would be! You have to play really slowly, as clean as possible, and even then there is lots of clean-up to do in the MIDI file. It took quite a bit of time, but it was doable. I imported the resulting MIDI file into Harmony Assistant (www.myriad-online.com/en/products/harmony). This has notation software for many instruments, including harmonica, and is what I've used for all my books in the past. You can input any tuning and get the TAB in various forms. To get the Jianpu (number notation, used widely in Asia) I used a new software called Cute MIDI (www.cutemidi.com). This was a big learning curve in itself, because all the instructions are in Chinese, but the developer helped me do what I needed. Now I had the notes and TAB in two forms, but how to put them together (since they were from two software packages)? I exported both a bitmaps, but they had different resolution... My website designer and business partner David Ireland helped me here, by using a graphics program to overlay the two files together and make a single document, which was finally exported as a pdf. The whole process took weeks, including all the research into pitch-to-MIDI software, learning Cute MIDI, and all the rest. To be honest it's put me off doing it again for quite a while! It was interesting learning all the new processes, but it's just so time consuming. For future instructional videos I'll either outsource a lot of the work I find difficult/tedious, or adopt a far more minimal approach with fewer extras. It might be easier to just do Jianpu or ABC format. Tunes at The Session website are in ABC but are instantly convertible to sheet or midi files. If I see a tune there that I like I open them in an app called midiscore and can then change the Key or tempo or whatever, and play it to get the rhythm and an idea of what the tune should sound like. I can’t really read sheet music either, but I can print the score out and then put in Jianpu notation or harp tabs under it with a pencil. Then I can see the notes, get a feel for the flow, and get the bonus of having to transcribe it. I just started doing this, hopefully in the long term I will find that I’ll end up reading music and won’t need the process any more. Hopefully you can find a method that is easy and efficient for you or someone you hire so that you don’t get burned out and can keep these coming! I’d love to see a set of videos and sheets/midi files/book and sound files for Unadorned, or New Chinese Harmonica, or New Irish Harmonica. Something dry educational for us would be for you to pick a tune or two, do it in Solo, and Paddy Richter, and Powerchromatic, and whatever tuning you think does it best. That would go a long way towards showing how the tuning choice can affect the feel of the tune. Not just show that tunings are “crutches” as the “traditional “ blues and chromatic players often think. Thanks for the paradigm busting! Maybe I did not catch the question all right. But it was not meant as a joke at all. How can I bring notation into a digitally reproducable form the easiest, fastest and cheapest way? 3. a lot of time consumption to do the work itself (after having learned the software etc properly), including correction and editing work. This might work and be necessary for professional publishing of sheet music, tabs, tutorials etc for commercial exploitation, especially concerning about larger amounts - i.e. if you want to professionalize your publications in the way CrawfordES suggested. Concerning about this my tips might be more like a joke. But I am a musician - and an amateur musician in fact. I will not purchase sophisticated software and electronic hardware and learn do all this non musical effort just for producing some sheet music or tabs. This I would rather consider as a boring and frustrating drag. I prefer to practice and play music instead. And I think some users here might think and do like this as well. Maybe I have misunderstood the intention behind the questions here. But my proposals were meant for people who would like to produce some sheet music, tabs, harp tuning layouts etc every now and then, for their own use and for sharing it with other people by the internet, as demonstration material in school or university, etc. Just like I do this too. And writing sheet music, tabs etc by hand and simply digitalising the physical results (i.e. pictures on paper) is much more easy, fast and cheap - as long as you are no skilled specialist for digital programming and electronical application and a professional publisher too. I certainly will do it like this most probably till the end of my life, which will not be so far in the future anyway. And my proposals were intended to help all these people who want to do this alike. I truly did not intend to insult users with a ore professional approach to this. And I did not want to make a joke one anyone. Please excuse me, if I should have misunderstood here something. I just wanted to help the one or the other user who might see this similarly like me. Btw: Before I would learn the use of respective software and electronical device up to a sufficient level, I prefer to learn notation and jianpu properly - wht I have started recently in fact. 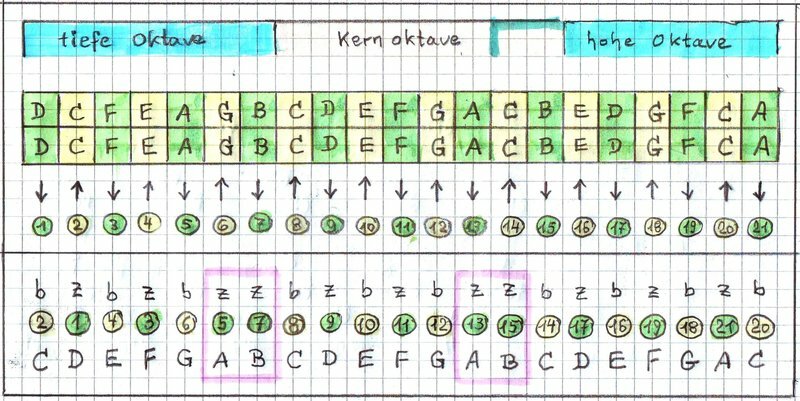 This might be to achieve faster and would speed up the manual production of sheet music too. Those who already are able to read and write sheet music fluently have this in advance even. At least I want to thank you for sharing your practical experiences. I do not intend to trivialize this, even if this here has turned out to become another long essay, which was not intended before. And I hope you will not tear yourself to become a specialist for electronics too and cannot find enough time and energy for your music and for your building instruments any more. I think we all would miss the musician and the harmonica maker more than another computer specialist or a publisher of perfect sheet music. I just did not catch this possibility at once and refer to me, because I took this out of the description and tabs of the reel contained in Edvin's post. If it were simple like that, this is a striking example how digging to deep into any kind of technical nerd stuff can make blind for the essentials. Last edited by triona on Sun Dec 16, 2018 7:57 pm, edited 2 times in total. Hello and many thanks for all the answers. I'm learning to play music and harmonica and reading notes. A good friend of mine is a saxophone player and has left me many play alongs and their notes (Bb and Eb). I scan them with Photoscore and then transpose everything to C instruments with Sibelius and add the harmonica tablature with a plugin. This plugin is developed for flute and is not so good in the lower register of a 64 harmonica. I slow down the songs to practice with Transcibe. Developing this process took a hard day. If the notes are reasonably good I need about 15 minutes to the Harmonica Ready sheet of music including slowed down songs. Admittedly a not insignificant effort but I also learned a lot about notation, Bb instruments and music theory. And this is where my question started. If the Myriad Harmony Assistant can read XML and quickly generate tabs for different harmonica tunings, that's my solution. My goal is to quickly add tabs to the existing notes for different tunings and here Sibelius and Musescore are still missing fine-tuning to get really good tabs quickly. It is always the art to find the right balance in life. And here concretely between making music and playing around with software. Good practice material makes you want to play more and leads to better learning progress. For me, working with the backing tracks alone has brought an enormous improvement. The music forces me to play on with small mistakes, to keep the beat precisely and everything sounds better together. I practice single passages like before with the metronome. So I try to combine the best from different worlds. PS: I'm always happy about good practice strategies. Especially learning the notes on the harmonica and the scales. Thanks again for all the answers and Merry Christmas. I think the joke was the Mixolydian Irish Scale play on words. I appreciated it as well. If I had realized this earlier, I could have written my reply a little bit shorter. And it has neither been invented by me nor by Edvin. Btw: This is a very nice site anyway. A real treasure trove for all folk musicians. But anyway - I hope the contents of these various posts can get a little help to the one or the other user - be it any computer geek or any brave old school acoustic musician with retarded skills and sense for computers. And maybe some had a little fun with the drowsiness of an old lady who is sometimes a little slow to catch on. It is produced by entering the code I posted above into an abc-to-pdf converter, and I think the result is nice enough. I originally found the notes on thesession.org, and then modified them slightly to match how I normally play the tune. Finally, I added the tabs. If you already have a file and just want to edit it a bit, I daresay it's not that hard, and I think anyone could learn it without too much pain. The resulting abc file can be found in the linked folder. You can read it by opening it using notepad or any simple text editor. Warning: The following procedure is not necessary! It is a convolved process that, on a small file it saves me a few minutes of work, compared to doing it totally "by hand".